I finally had some time to do a proper review for this Express 3/4 sleeve striped dress even though I’ve been wearing it non-stop. A t-shirt dress had been on my wish list for quite some time. I was looking for something that is suitable for both work and play. I spotted this dress a few weeks ago at Express and felt in love. The fit is true to size for Express clothing. I am wearing an XS in this post. The fit is not perfect but doable. Since the style isn't supposed to be too fitted, I am OK with it. On the weekend, I paired this dress with flats. The fabric is made up of 60 % cotton and 40 % modal. This lightweight material makes the dress quite comfortable to wear. Express was running $15.00 off your $30.00 purchase promotion a few weeks ago. With the discount, this dress ended up costing me only $35.00. It’s not bad for something that can be worn for work and on the weekend. It is also a great transition piece from summer to fall. If I have to nitpick, it would be the color combo. I wish this dress comes in navy/white stripes (nautical theme) vs black/white (jailbird?). I asked my husband if I look like a jailbird wearing this dress and he said “kinda” LOL =) This dress also comes in navy/red combo. I think this is adorable...it looks lovely on you! Sydney sweetness. Awesome dress and lovely blazer to go with them. Cute pumps as well. You dazzle with both sweetness and beauty yet again! It doesn't look like a jailbird at all!^.^ it fits very nicely on you! Looks comfy and preppy and very work or office appropriate under blazer! I like it a lot! You look beautiful in stripes Sydney! oOo I was debating on this dress because I didn't know what else to style it with besides a belt. I love the blazer you paired it with. Thanks for the styling tip Sydney! btw-Some celebs love the dress too. The dress looks really cute & you don't look like a jailbird. Lol. I love stripes on anything! I'll have to check it out......haven't been to express for forever! 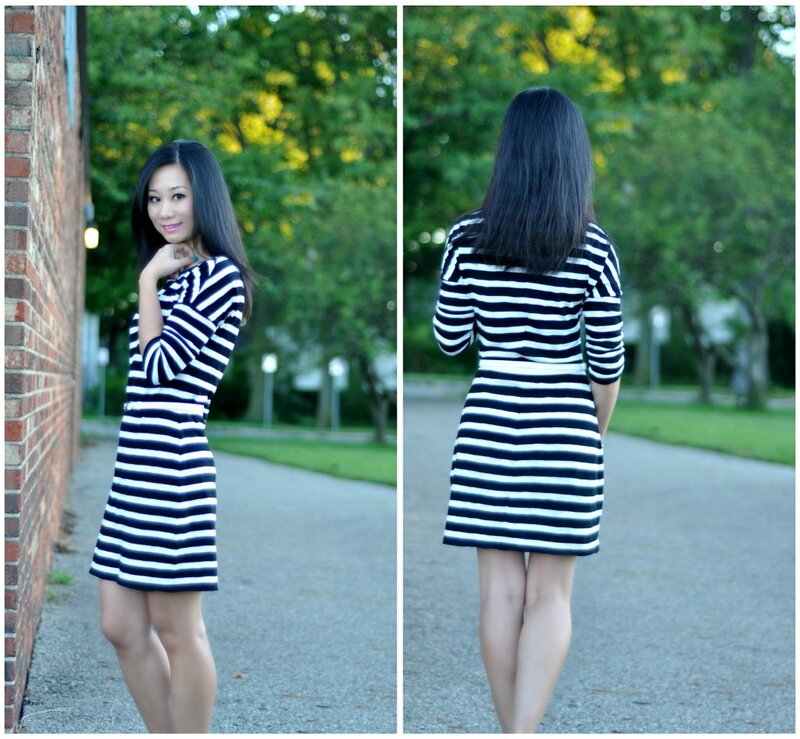 I love this 'jailbird' dress on you! Thinking if a colored belt maybe red would break the dress up? I don't think you look like a jailbird at all! I love the look with the blazer and $35 is definitely a good deal for a dress! i really like this striped dress and it's a great deal at $35! Love this look! Great choice on the color. You look so adorable. This dress is such a beautiful basic! And you can't beat that price either, I like that the dress fits you loosely so you have more freedom to dress it down. I love how amazing you look in stripes! Absolutely love this look on you! I have a similar dress from J. Crew. @JustPatience Thanks for letting me know. You look great in that dress!